Like to boogie...and the nightlife? Loxton in the Riverland approximately 240 kilometres east of Adelaide, has a fascinating history and really is a garden town. Known as the ‘Garden Town of the Riverland’, Loxton’s beautifully maintained gardens have been adapted to the changing climatic conditions, and the town is now a recognised leader in the use of low-water, sustainable landscapes, and testament to the proud community spirit that exists in Loxton. The Loxton district boasts first class accommodation, unique attractions, a nationally recognised golf course, thriving retail and business centre, wine tasting, numerous festivals and events, beautifully maintained gardens, and a variety of nature-based activities such as swimming, boating, canoeing, fishing and bushwalking. There are some wonderful experiences to also enjoy in the region. Loxton Historical Village has over 45 fully furnished buildings and sites exhibiting the farm equipment, machinery and household items used by the early settlers. The Village is now home to the 1956 Murray River Flood Photographic Exhibition - wonder at the damage depicted in these amazing photos. Watch the blacksmith at work and smell the bread baking during The Village Alive Days. An adjacent extension to the Village provides a visual and tangible history of Loxton’s development and irrigation practices. Banrock Station Wine & Wetland Centre at nearby Kingston on Murray is considered the ‘jewel in the crown’ of Riverland tourism and a ‘must-see’ while in the Loxton district. Experience the self guided walking trails where you can get up close and personal to the spectacular wetlands and birdlife, or relax on the spacious deck and enjoy exciting regional cuisine while enjoying a glass of Banrock Station wine. Sport has always played a big part of life in Loxton and the town boasts many first class sporting facilities. The picturesque 18 hole, fully turfed golf course is ranked in the top 10 courses in the state by the Australian Golf Digest. Excellent dining facilities are available. Select from the extensive bistro menus or dine alfresco on the balcony at the Loxton Hotel Motel, or enjoy a quick bite at one of the many coffee shops, bakeries and take aways. Children enjoy the Loxton Community Club with their undercover playground to let off a bit of steam while you enjoy great value for money bistro meals. Visit Loxton during December and experience the joy of Christmas as ‘Loxton Lights Up’ with the annual, award winning Loxton Lights Christmas Festival. This extremely popular 5-week festival has something for everyone - from the young, to the young at heart. Christmas Wonderland, Big Santa, fireworks, craft fair, Santa’s Walk, the Singing Christmas Tree and decorated Christmas trees, Santa’s Cave, Community Carols, Church tours and Martha’s on Martha are just a few of the wonderful displays and activities on offer. Loxton offers a diverse range of accommodation to suit the most discerning or those on a budget. 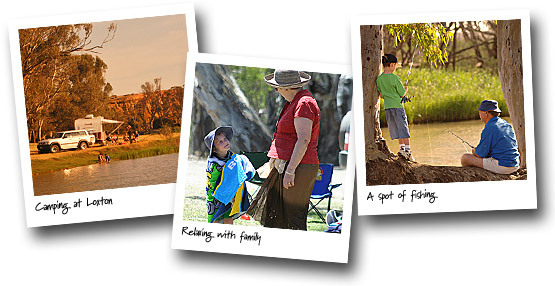 Bed and breakfasts, holiday homes, motel suites, cabins, houseboats, back packers, the Loxton Riverfront Caravan Park and camping at the waters edge are all available - come and experience our hospitality. Why not hire a houseboat? There's no more relaxing way to discover the Murray River (and all she has to offer) than aboard your own floating home away from home. Discover all that this truly spectacular region has to offer - be sure to allow a few days.